If you have a Keurig Coffee System, you know how pricey the filters are. 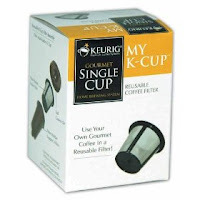 You can get a Keurig My K-Cup Reusable Coffee Filter for only $8.99 – which is 40% off of the retail price. This saves you from having to purchase all of the individual cups. If you click on ADD TO CART WITH 2 DAY SHIPPING, you can get it shipped for free. Doing this will sign you up for Amazon Prime for a one month trial offer — just cancel when the month is up!